To be submitted to LA+. As urban development and residential sprawl take over wilderness environments, the wildlife that inhabited those environments gets displaced. According to the article Designing Our Future: Sustainable Landscapes by the American Society of Landscape Architects, by the year 2050, the continued expansion of U.S. cities will consume land the size of Pennsylvania. The article goes on the say, even with the existing wilderness areas, many habitats are already too small to sustain wildlife populations. In New York City, where urbanization began hundreds of years ago, local wildlife is managing to survive and reproduce, but not without struggle. In the case of bird populations, NYC masters expectant, Rona Binay, informs that 988 million birds die each year because they are unaware of the reflective glass, that to them, looks like ample sky. Bats also should occupy the sky in a healthy urban environment. Currently there are measures taken against them, however they are a key element to the control of insect populations. As the practice stands, architecture is designed with the human user in mind. In the hierarchy of design, human needs should remain primary, however wildlife accommodations should be a serious consideration. 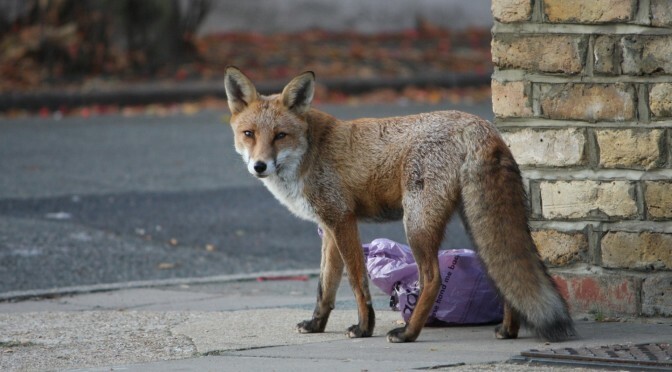 Humans and wildlife can coexist, even in an urban setting. We are reliant on them as pollinators, reliant on the plants they pollinate for clean air, and reliant on clean air to breathe. Beyond the physical survival needs, interaction with the natural world adds a dimension of comfort and inner peace that is noteworthy when discussing urban dwellers’ quality of life. Specific steps should be taken in three sectors of human life: residential, public, and commercial. Within the world of urban outskirt’s residential, the typical homeowners’ practice is to level a plot of land covered in a chemically maintained lawn with some sporadic trees all fenced in from the surrounding land. This offers little to no habitat for local wildlife. Awareness through regular interaction with urban wildlife would encourage homeowners to incorporate a variety of local shrubs, low-lying nesting plants, and nectar plants into their residential landscape. Public spaces have a large impact on the surrounding environment: both humans and wildlife. Specifically in New York City, Central Park provides ample amenities for wildlife and fosters the mission of coexistence within an urban setting. Wildlife living within the park does not need to stray across major roads to reach another habitable land area. Mixed use public facilities could incorporate similar strategies; providing habitat for wildlife and beauty and function for urban dwellers. Commercial development might be the most difficult sector to persuade, being an area of development that is largely motivated by financial efficiency. To appeal to this specific area, the city zoning committee could provide bonus incentives to companies that choose to incorporate wildlife planning into their landscape and building architecture. This could include roosting or nesting alcoves on the facades of their designs, promoting safe environments for shelter and reproduction. As well as, incorporating shrubbery, low-lying plants and trees to provide additional shelter and food to local birds, insects, and mammals. Urban wildlife in New York City is not a nuisance to exterminate; it is an opportunity for intricate and responsive building and landscape architecture.